“I actually tried to fight in armor myself,” the game developer Daniel Vávra said. We were in the middle of a demonstration of his game in progress, Kingdom Come: Deliverance, which is nothing less than an attempt to make a no-magic, realistic answer to the epic role-playing game Skyrim—set in a historically accurate recreation of 15th century Bohemia. Swords slide off armor or smash it, rather than effortlessly slicing through it. Stamina fades fast. This was the fruit of his field research: Endless combat depletes the combatant. Sometimes you’re better off lifting the front of your helmet, so you can breathe freely. In the game he wants to make, there will be more interesting options than fighting all the time. Combat is exhausting in the game Vávra is making with more than 70 developers at Warhorse, the studio he helped found in the Czech Republic. Maybe in real life, too, where he and I might be seen in different sides of a battle, him a game developer who proudly and loudly supports the GamerGate movement, me the editor of a site that has both covered and been at odds with that movement for months. I was meeting with Vávra at E3 out of curiosity about his game—one of our writers has been really into it. A PR firm had invited us to see the game, and I was sure it’d make for an interesting meeting. I was also curious about what makes Vávra tick. I’d only seen him from afar, in figurative armor. I’d spotted him as a pugnacious user of Twitter who would mix Tweets about game design with angry complaints about so-called social justice warriors and charges that, as he put it last October, “the future of our biz is at stake and ‘progressive’ media are destroying it with their hateful narrative.” He was one of those people I didn’t think I had much in common with, angry last fall when he felt gamers were being attacked by the gaming press and participating in a cycle of outrage that I’d come to see exemplify GamerGate and its opponents, moving from controversy to controversy about discussions of race and gender in games. Our styles are different, to say the least, as I saw then and even in the weeks since. My outlet would write, say, negatively about the ham-handed decision by Apple to wipe all games with Confederate flags in them out of the iTunes App store, whether they were based on history or not. We identified a pattern by Apple of not treating games like a respectable art form. Vávra went way further, taking to Twitter to liken Apple CEO’s vow to remove, as Tim Cook put it, the symbols that feed racism, to ISIS’ attempts to destroy monuments and eradicate history. He came off as playing to Twitter fans, as someone who vilified people he disliked. But there had been an interesting twist on the eve of our meeting at E3 last month. He had written a bunch of Tweets about violence in video games and how the gaming press and gaming public lapped it up. He suddenly found himself in sync with his intellectual enemy. Daniel Vávra and Anita Sarkeesian on the same page. Unexpected. Vávra and I met on the final day of E3. We’d wind up meeting a couple of times that day, first in a meeting room in the Los Angeles Convention Center for his company, Warhorse, and then later at an Irish pub where there was a party for their game. I found him to be an interesting thinker about video game design, but I found us expectedly far apart on the cultural drama in gaming that dominated last fall. If you were sitting in on the game demo at Warhorse’s room at E3, you wouldn’t have known that Vávra supports GamerGate. In my mind, when it comes to the game, it doesn’t matter much, but he’s also not shied away from letting fans of his game know he’s into the movement. Last year, he appeared in a video updating fans about Kingdom Come wearing a shirt that read: “#BASED: White privileged able bodied cisgender basement dwelling manbaby virgin scum phallocratic MRA neckbeard shitlord.” That’s basically a roll call of the kind of terms GamerGate supporters say they’ve been called by anti-gaming people. At E3, Vávra was more toned down. He wore a shirt that had a lizard on it. He was friendly. Vávra’s game demo lasted about 20 minutes. He spoke while another member of the Warhorse team played a build of the game. Another journalist and I sat on a couch, watched and listened. Because I can’t help myself, eventually I started asking questions. Vávra classifies Kingdom Come as a first-person open-world, realistic role-playing game, one that emphasizes player freedom. 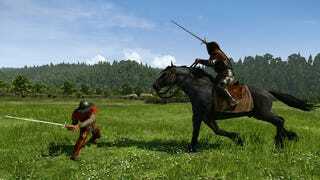 “We put a lot of emphasis on interesting, not-black-and-white characters and also most of the quests are playable by non-violent ways,” he said during the demo as his colleague walked a character through grassy fields. “The combat is important but it can be avoided most of the time.” The emphasis on historical accuracy means there are no dragons and no spells. No tomatoes or corn either, because he said those were brought into the region from America in the 18th century. Kingdom Come is no small-scale indie. It has been in development for about three years, but it’s still about a year out from completion, when it’s set to come out on PC and console. Warhorse has raised more than $2 million from gamers interested in backing the game and has delivered a small playable stripped-down section as an alpha build. At E3 they were showing a more expanded alpha, featuring three square virtual kilometers of a final game that they expect to be a few times larger. This newer build, they hoped, would be available for backers to play this week. The game’s plot involves real war in the early 1400s and a struggle between the sons of the emperor Charles IV. There was “an ugly civil war in which you lost your family,” Vávra explained, “Your hometown was burned down so now you are in the service of a noble who is trying to help the king from captivity.” At every turn of the demo, Vávra was speaking of some ambitious feature—of orchestral music that would change moods while you were playing without you initially noticing, of a crime and justice system that would spread an awareness of your actions to every one of the game’s characters and that would punish imprisoned players in some “next level way compared to what is usual for RPGs.” It’d be better than Skyrim’s approach, he vowed. He showed some combat, first with a sword and then with a bow, promising more realistic physics-based battling. In his team’s game, swords slide over armor rather than penetrate it. Players strike in eight directions and—forgetting about the realism thing for a moment—activate a slow-mo feature if they land enough combos. The combat stuff got me thinking about his violence comments. I’d heard him say combat would mostly be optional but I sensed it’d be used plenty by the game’s players. Video games are about interaction, after all, and combat is a popular way to interact. Still, I wanted to ask him about what he’d said about agreeing with Sarkeesian about gamings’ emphasis on violence. “I see your Tweets once in a while,” I said. He laughed. I noted that he’d been Tweeting about violence but I suggested that combat is often a means to fun and that fun is often what game developers are going for. I asked if fun was even the right word to be using about his game. This is exactly the kind of talk that many a game creator and critic across the political spectrum has given when discussing ways that video games can advance as an artform. These are the kinds of talks about game design I’ve enjoyed having with the scene’s creators for a decade. What a cliffhanger. We were badly out of time and his PR guy was cutting in. No time left to explain. Maybe we could meet up again later. We would indeed get to talk later, some of it over beers and some of it over e-mail. I asked him why he got into GamerGate and what he felt it was all about. He said he wanted more discussion. I thought there’d been more than he’d acknowledged. Not everyone freaked out about, say, women in Assassin’s Creed (I didn’t) or refrained from talking about journalism ethics issues (I talked about them a lot). But also, I just didn’t find it so bad if people were debating how much it mattered to play a game as a female character. I didn’t expect that there was a right answer. His experience with GamerGate is dramatically different than those of the people with whom the movement dislikes. It can be maddening to see Vávra talk about GamerGate members always being nice to him, to see him celebrate what he says are new voices speaking up, to hear him tell me that the only unkind things ever done in GamerGate’s name were by trolls and teenagers and are therefore not to be taken seriously—all the while being aware that no matter how positive GamerGate meet-ups are, no matter how much community GamerGate members have built, the abrasive rhetoric from the movement and the roving social media pile-ons so many of them favor have chilled the voices of critics and creators with whom they disagree. Vávra’s views on a lot of this were partially shaped by criticisms of Kingdom Come for its lack of black characters. The messy backstory is that a blogger who writes about people of color in medieval Europe had been asked if it was realistic for a game like Kingdom Come to not have people of color. The blogger said it’d be inaccurate and scoffed at the lack of inclusion of a playable woman in the game to boot. They got hate mail for their efforts. Vávra felt he was being called a racist and that, based on his research of his country’s history, he was in the right. I get him, though there’s that whole book-burning thing, and I also feel like he’s sparring with strawmen. It’s easy to think that the people you disagree with are histrionic and immune to reason, especially on Twitter, a platform that strips the nuance out of most arguments thanks to character limits and a culture dominated by a quest for validation through retweets. Our vantage points differ. I’m not very worried about critiques about video games, no matter how harsh they are. Why? One of my formative experiences when I think about the risks of censorship and games is sitting in the U.S. Supreme Court and listening to lawyers for the video game industry successfully defend gaming’s protections under the First Amendment. For Vávra, one of his is growing up in a former Communist country. When we spoke over beers, I noticed a pattern. Anita Sarkeesian’s name came up, and he dismissed her as a “totalitarian,” said her research was poor and that she was making demands. When the game developer Zoe Quinn’s name came up—recall she’s the developer whose ex-boyfriend wrote a post shredding her reputation that somehow kicked a lot of this GamerGate stuff off, and, yes, Quinn briefly dated one of our reporters—he snarked about how her game Depression Quest was just a web page and got attention because it was about depression. I sort of get his issues with Sarkeesian, though I feel her influence is exaggerated. Quinn seemed like a weird fixation, a vestige of Twitter fuming that seemed less relevant when said out loud. The pattern, though, was that people might be paying attention to them and their ideas. Time and again, I sensed, he was annoyed about who was listening to whom, about who got attention, about whose voices were heard, about who was making an impact on games and games culture. That was the pattern. Then, in its own weird way, the pattern walked up to us. Two guys in the bar approached where we were sitting. I assumed they were there for the game, that they’d recognized Vávra and wanted to say hi, maybe talk to him about his game. That wasn’t the case. They were Kotaku readers. They’d only recognized me. This kind of thing had happened when I’d been talking to game developers before, and it’s always awkward. I’m just a reporter and a critic, I always tell them. This person is the one who makes the cool stuff you like playing. This is the person you should be more excited to see. I explained to them that Vávra was a game developer, that he was making an ambitious game. I pointed to the back room where he was about to give a demo. You should see the game, I told them. I think you’ll like it. You should hear what he has to say about it. I can sympathize with Vávra and others like him when they say they just want to be heard. Who doesn’t? But it remains hard to sympathize with so much of GamerGate that still traffics in ugly, angry debate, that swarms those with whom they disagree. Some figures in that scene, such as the developer Adrian Chmielarz, have indeed tried to flesh arguments out and make things more civil. More of that and fewer reasons for people to self-censor for fear of GamerGate’s wrath would be a godsend. After those guys approached us, Vávra and I were pretty much done. He did have to show the game. We shook hands. We’d talked, maybe to each other a bit, probably past each other a lot. He headed off to do the demo. One of his colleagues approached me as I was leaving. “He’s a bit of a badboy,” they told me. Yeah, I said. I got that.